The anatomy of dental implants consists of two important features, a titanium post and an artificial crown. The titanium post is incredibly durable and will eventually function like a tooth’s natural root. Placed directly into the jawbone, the bone will fuse to the post over time through a natural process known as osseointegration. This occurs because the body treats titanium like natural mineralized tissue. Once this process is complete, a custom made dental crown, which is tooth shaped and made to precise specifications just for you, is attached to the titanium post. Filling in the empty tooth socket, the crown will allow patients to eat a variety of foods with ease and smile with confidence. Crowns can be made from very natural looking materials such as porcelain. 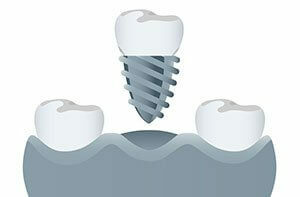 Dental implants can last a lifetime, unlike bridges, partials and dentures that may need to be replaced several times. For example, patients with dentures will require new sets every few years, especially if the jawbones atrophy. Bridges also require repair and replacement over time as well. Fortunately, dental implants are incredibly durable and last for decades, if not a lifetime. They also support bone health by preventing bone resorption. Extensive bone resorption requires reconstructive procedures such as bone grafting, which can be costly and invasive. We encourage patients to look at dental implants and their cost as a long-term investment in one’s health and wellbeing. Dental implants are a great treatment option to replace missing teeth. To learn more dental implants, contact Prestige Oral Surgery today to schedule a consultation at 732-297-7000.